As I bandaged my finger -- my first bite from Lux’s recently popped chicklets -- Josh and I were discussing that despite the extensive community of overland travellers, we haven’t come across many with an infant in tow. Some people thought we were crazy to leave on a Pan-American journey when Lux was only 2 months old, but babies make excellent travellers. They don’t require much stuff, take up very little space, and are soothed by rolling along in their carseats. Above all, their happiness is a function of simply being with the family, rather than where they are or what they’re doing. That being said, a lot has changed since we left, when Lux couldn't really wiggle around and slept a lot. Now she's an active 7.5 month old who rolls, crawls, pulls herself up to standing, puts everything in her mouth, and seems to constantly maneuver to throw herself off the king size bed over the truck cab no matter how we try to blockade her. Travelling full time with an infant and living in a confined space definitely has its challenges. And society would like us to believe that many of these challenges can be overcome by buying the plethora of baby gear and gadgets on the market today. It's easy to get loaded with a bunch of baby stuff that we don't really need -- we fell into this with our first 2 kids. But since we decided to live a minimalistic life on the road, with much less space, we had to be very particular about which baby items we chose to bring. These are some of the factors we considered when packing baby stuff and some of our favourite and most functional baby items. -How much space does it take up and how small can it be packed down? -Can it fulfill more than one function? -What is the longevity of the item in terms of age? The cocoon is a more practical solution for a bassinette and can be used as a baby carrier alternative. We’re all for attachment parenting and baby wearing, but sometimes it’s nice to be able to put your baby down in a warm, clean and confined space. For us, the cocoon has also been an alternative to a baby swing with the parent's arm strength and willpower being the only power required. This is also the most covert way to cart your infant around: we’ve taken our kids to hockey games and the movie theatre in the cocoon, at yoga studios people think the cocoon is just a duffle bag and are shocked to see a sleeping baby inside, and on one occasion we even brought Lux to a lounge without anyone being the wiser! Out of all our baby gear, this item has received the most admiration and interest wherever we go. There’s a reason why cultures all over the world have been wearing their children for thousands of years. Besides the facts that skin to skin contact is proven to help nurture infants, and babies don’t begin to emotionally separate from their mothers until age 2, there are also some incredibly practical benefits to this method of baby carrying, especially when living nomadically. The Tula is comfortable to wear and significantly lessens fatiguing over time (vs. carrying an infant in your arms, a carseat, a hiking backpack, the cocoon, etc), mothers can nurse while the infant is in the Tula, parents can be hands free, and increased warmth during inclement weather. Compared with other baby wraps/carriers that we’ve used, we love the Tula because it’s easily adjustable for Mom and Dad to wear, quick and easy to put on, baby can be worn on our front or back, and it provides excellent support for baby’s spine. 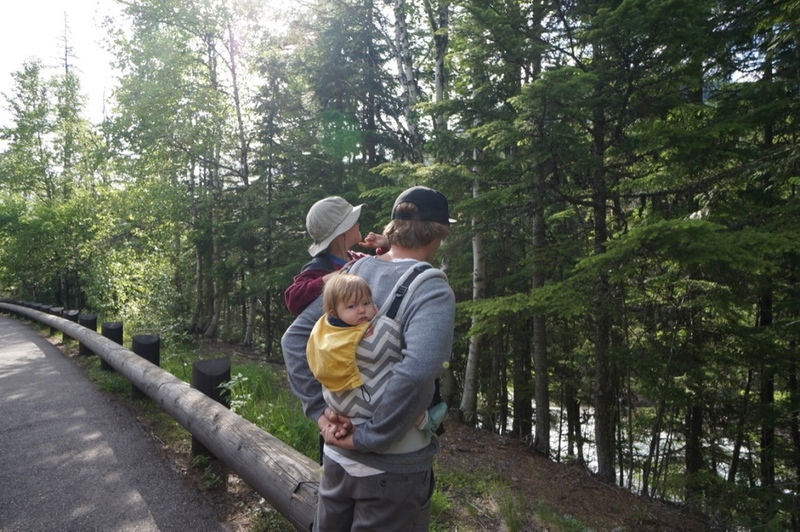 The Tula has excellent packability and for us, it fulfills the same function as a stroller. Plus, despite the fact that the Tula is tailored, they come in a myriad of patterns and look OG. We use this hiking backpack to carry Lux and all our gear, either going up a mountain or gallivanting about town. We love it because it's easily adjustable for both of us to wear (it takes about 2 seconds to go from size XS to M), great quality, super comfortable and light. There’s also enough room in the trunk for diapers, wipes, snacks, and extra clothes, so we often don't need bring a second hiking backpack -- this is important because the parent not carrying Lux has to play racing games with Arjuna as we hike! The sunshade that comes with the backpack works great, and we also highly recommend the rain cover and carrying case as additional accessories. Lux loves to be facing forward and up above us all so she can take everything in during our hikes. There's also a nice soft pad that she can rest her head on when she inevitably falls asleep! Sometimes it's just nice to be able to keep Lux confined! When we're outside she loves to put grass, rocks, dirt -- pretty much anything she can get her hands on -- in her mouth. She's also getting good at pulling herself up to standing, but she inevitably face plants if we're not vigilant. We use the GoPod to keep our now mobile infant confined and content so we can relax for a short time! Lux can work her leg muscles, be upright, bounce, and play with toys off the ground. Made from canvas, this travel version of an exer-saucer also fulfills the function of a playpen. It's super light, cleans and dries easily, and folds up very small in a travel case. Our beautiful wood Svan highchair unfortunately did not fit in the Earthroamer! But this clip-on high chair easily adjusts to most tables, from our table inside to an outdoor picnic table. The tray accessory, which is included, has been very handy for outdoor eating situations to give Lux a clean play area in front of her. We just started using the Lobster recently and have noticed how much Lux loves to be at the table with us during meals, even though she's not eating much yet! Babies just want to be part of everything. (It's also nice for Mom and Dad to be able to eat simultaneously instead of trading baby between us!) The Lobster is sturdy yet compact, and folds down flat into it's own travel bag with handles so that we can store it easily when it's not in use. Josh gives me a hard time about how often I say that I love this mat. But I do! We originally laid out baby blankets (now too small) and a Mexican blanket (big, bulky and difficult to store). But this outdoor mat comes almost everywhere with us for Lux to crawl around and play on and for us to sit on. 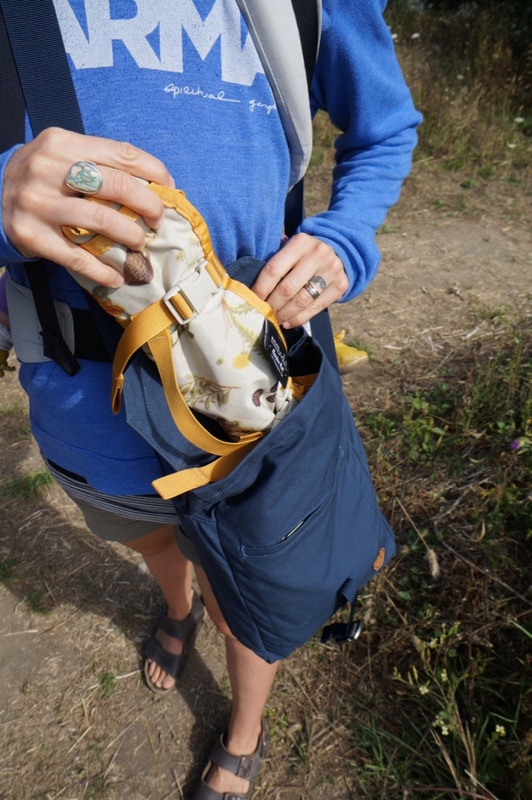 The Meadow Mat rolls up small and tight with clips and a handle and fits easily into the hiking backpack, diaper bag, or even a purse. The bottom is sealed so it keeps the dampness on the ground and away from baby, and the top is easy to wipe off, clean and dry and comes in super fun prints. There are a few items that we brought that we're still not sure about. Despite the fun Lux had this past week when Josh finally found a tree from which to attach our Jolly Jumper, that item really hasn't had much use, as there is nowhere to hang it from in our small living space. The Chariot bike trailer/jogging stroller (which we had our box on the back of the truck specifically designed store) is something we've often talked about ditching. When we use it, we're glad to have it, and it is very multi-functional, but it takes up a lot of space and is time consuming to get out and set up, and break down and put away. Other potential "issues" of traveling with a baby and living in a small space were easy to solve. For example, we didn't need to bring a crib or playpen since we've always co-slept with our babies. Although we've never really had a proper change table, for Lux we just brought a couple of sealed-bottom covers designed to go on top of change pads, and we lay those on the bed to change her. When we were at a Walmart last month, Josh almost bought a cheap umbrella stroller for Lux -- something that we could just store in the backseat and pull out easily instead of assembling the Chariot. But we decided against it and are glad we made the choice to keep it simple by using the Tula or the Osprey baby backpack instead. In the end, there are probably a few baby things that we brought that we could do without. But honestly, we've racked our brains and there isn't any item that we left behind that we feel we can't live without or that we really wish we had brought with us. Being on the road with limited space has forced us to be more mindful and creative. We're learning that it's possible to travel with an infant much more simply than we ever imagined possible!